This is a group effort: Jefferson Girao helped me get the design right, and David McHoull and Deluan Quintao from our ThoughtWorks’ Toronto office worked through to an implementation. Additionally, David has written much of the blurb below. IaC pertains to much more than just environments for business apps, but this article focussed on just that. The elasticity we want in this context, is to provision an environment quickly and to de-provision it quickly if needed. Recreation quickly would be assumed, and it would mean that application dev teams could relinquish environments without worrying about delays/red-tape in getting them back. That’s the key business benefit to very large organizations. The environments that the application could be deployed into is somewhat orthogonal to the application itself. Indeed, those environments won’t all have the same version of the app installed in them. We could easily have more than one QA environment if we’re developing concurrent development of consecutive releases. In recent years the industry has used Puppet (and alike) for much of the configuration of machines in a stack. DevOps best-practioners use a source-control system for that, and quite often one that is separate to the application’s source repo. I think it is fair to say that you can’t have IaC without that being under source control too, and that engineered systems that don’t allow to round-trip editing of blueprints/scripts in source-control will become obsolete. 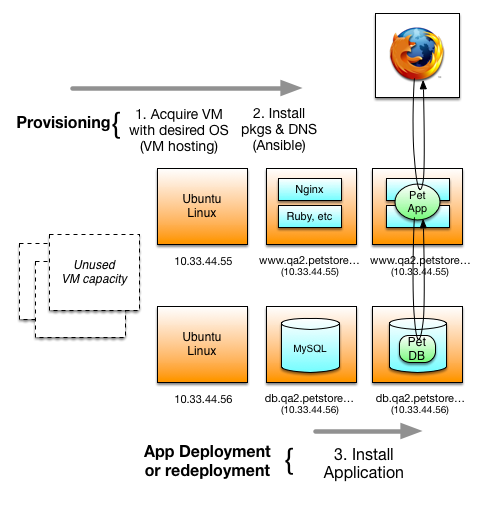 Either way, browsers (Firefox shown) can’t use the application until provisioning and app deployment are complete. You see that We have keywords for Ruby 1.9, Passenger, Nginx and MySQL in this design. YAML is very human readable of course, and the ideal way to still meet the “as code” requirement, as well as being very compatible with source-control. We are also not saying where the item environment will be provisioned, and are instead leaving this to the DevOps team. The where/how is controlled outside this YAML file, and could be changed without changing this script. The ‘auto-environment’ command is a Ruby Gem, though it could easily be Python etc. To accomplish this, Deluan and David created another Github project github.com/deluan/petshop-rails-ansible with all the roles and tasks needed to install MySQL, Ruby, Passenger, Nginx, and dependencies. This project also provides an Ansible playbook that handles the provisioning of the machines, in this case, by launching instances on EC2, opening the appropriate ports, then configuring the DNS records through Amazon’s Route 53 (which is great but has usage costs). Roles is an ansible thing that’s reusable/templatey. After a bit of an initial learning curve to get their heads around Ansible and its conventions, these roles were fairly easy to write, they said. The EC2 tasks in particular were very straightforward thanks to modules already included with Ansible. Above I was referring to the idealized “our_roles_dictionary”, but for the proof of concept it was ‘petshop-rails-ansible’. The bigger dictionary would grow out of this, and we’d rename it later as we subsumed second and subsequent applications. We can diff environments on the command line. We can search (grep, ack) through a whole tree looking for things. Of course there are benefits from being in source-control generally, and much of what I wrote in Very Small Data applies. With or without the application itself? 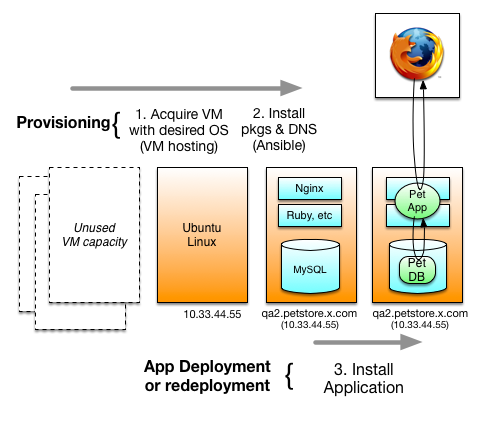 The provisioning technology could easily deploy the application after setting up the base OS, and installing packages. That’ll work if the application is in a binary store, and ‘latest’ is identifiable. It could be that the provisoning app perfectly sets up the base environment, but there’s no installed apps or table-shapes. In that case a regular CI tool, could have a on-demand deployment capability that has a drop-down of environments (subject to permissions) to deploy into. That would pick up where the provisioning app left off, and deploy the app itself as well as do schema/table-shapes work. Indeed, that CI on-demand capability should not require freshly provisioned environments necessarily, even if it can also work that way. De-provisioning could work by just using the domain names implicit in the YAML to locate allocated VMs, and from that interoperate with the hosting system to de-provision them. The YAML might have been updated since last provisioning though, so you’d really want to interrogate a real DB that has usage info in it. There’s no reason why a CI daemon could not spot the changes to appname/envname.yml files and automatically de-provision and re-provision an environment. Not for production perhaps, but the only reason why it would not work for dev/qa/uat/staging is the implicit dropping of the data accumulated since the last provisioning. Truly Agile teams have canned starter data in source-control as part of the application build/deploy - records in the style of “Fred Flintstone” test data. De-provision/re-provision is infinitely easier than applying deltas to an existing environment and actually much more attractive as it is perfectly repeatable. Whereas you might have been happy with www.qa.petstore.dev.your_company.com for the QA environment, production would be www.petstore.your_company.com. or petstore.your_company.com.. Tying the Amazon Route53 service to *.dev.your_company.com would seem smart, but maybe you want real DNS to control the production domains, without a per-use fee. That’s easier with a dev sub-domain, and would allow you to neatly avoid the corporate SecOps people while developing. Route53 is very scriptable over rest, but is the same true of your regular choice of DNS provider? Not always is the answer. This is duplicating the work of ..
.. A team that colleague Sam Newman managed for project called Phoenix a year ago. Sam’s one is pretty similar, though it had all environments in one file. What it did have not, so far, got round to coding was the database that chronicles usage. Note: Every company of sufficient size and age, has a project called Phoenix. Or two. Hashicorp have a new technology Terraform which is in the same space - terse blueprints under source-control - yay!